Here in the Northwest, Washington is often held in contrast to Oregon. Oregon, and most specifically the Willamette Valley is seen as a region that grows a specific varietal wine, the state's signature Pinot Noir. And as other varieties begin to take hold in the Willamette they tend towards cooler, higher acid varieties like Chardonnay, Pinot Gris and Riesling. Washington on the other hand is known for it's Cabernet, Syrah, Merlot, Riesling and the list of varieties that do well in the state goes on and on. Hell, even varieties that are difficult to ripen, like Grenache have found a home in Washington. This diversity is often seen as Washington's blessing and curse. Oregon has a reputation for it's Pinot Noir, California's reputation rests largely on its Cabernet. Washington? We make everything in Washington. One wine that you don't find much of is Pinot Noir but you're beginning to see the state produce a few more bottlings. The Washington Pinot Noir that has developed the most consistent reputation is one produced by Syncline in the Columbia Gorge. Two vineyard sites that have developed a reputation for growing classically cool climate varieties are Celilo Vineyard and the nearby Underwood Mountain. 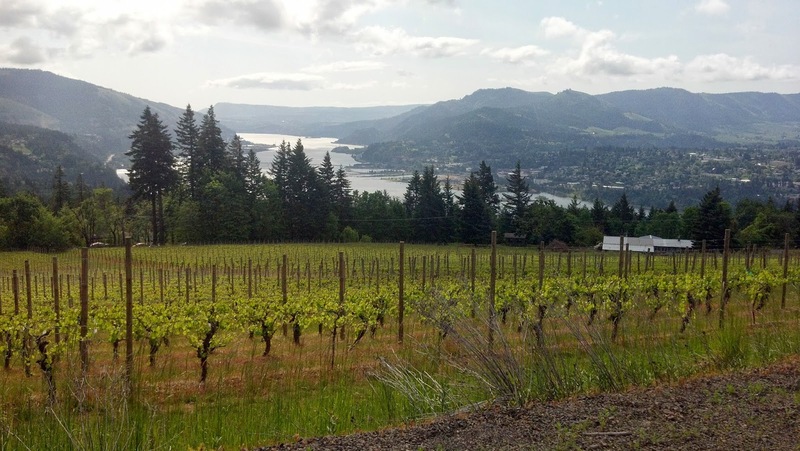 The Celilo vines are much older than the relatively young Underwood Mountain site, and both vineyards sit in a climatic zone that is even cooler than the Willamette Valley. Michael Savage at Savage Grace Wines is making a Pinot Noir from Underwood Mountain Vineyard and he feels like the vineyard site and Pinot Noir are a nearly perfect match. "I don't think I would be making a Pinot Noir from Washington if it wasn't for the Underwood Mountain Vineyards site. It has so many of the right elements for Pinot Noir - soil with good water retention and ample rainfall to allow for dry-farming, a cool climate moderated by the Columbia River, the vast amount of sunlight due to to it's slope and southeastern exposure and the right trellising, and breezy conditions which lessen disease pressure at important times. The site just barely ripens the grape, which I think is important and leads to more work from the vine and a more interesting wine at the end." Michael also credits the vineyard management practices that Jack Brady, the vineyard owner employs. Cropping at only about one ton per acre and careful clone selection has allowed him to make wines that display an elegance, texture and minerality that he's looking for. 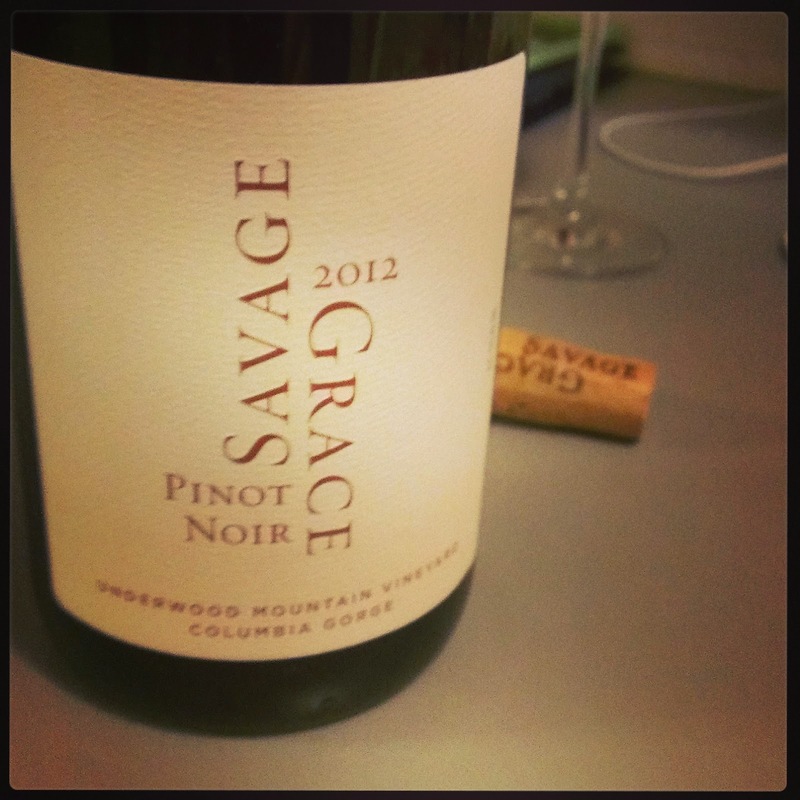 The 2012 Savage Grace Pinot Noir, Underwood Mountain Vineyards is all about bright fruit, brambleberries, strawberry and a great acidity. For Michael it reminds him of a Cote de Nuits Villages wine. He's very excited about the wine he's made and as someone who is still very new to making Washington wines I look forward to what he does with this vineyard and fruit as his familiarity with it grows. The wine is a classical example of the elegance of Pinot Noir and shows how diverse Washington's wine growing regions really are. Further east into the Walla Walla Valley (and frankly back into Oregon) and we find another example of Northwest Pinot Noir grown outside of the Willamette Valley. At Saviah Cellars, Rich Funk is making a riper style Pinot Noir from a vineyard site that is becoming one of his favorites. Couse Creek Vineyard sits at 1900 feet of elevation and in Rich's estimation it's the vineyards positioning that allows the Pinot to retain it's acidity and develop physiological ripeness without alcohol levels that can mask the wine's fruit. "This is a pretty old vineyard by Walla Walla Valley standards planted in the early 1980's by Chris Banks. He planted a few different clones but the one I have been using is a Pommard clone. The site is situated at 1900 feet on the east side of a north/south ridge on the Oregon side of the Walla Walla Valley AVA. A stunning site, this has quickly become one of my favorite sites to visit. A warmer site than most in the state of Oregon for certain, but the aspect and elevation do help mitigate the detrimental aspects of the hot summer weather. As the angle of the sun decreases in the Fall along with the diurnal shift in temperature this site is able to achieve the hang time necessary for physiological ripeness." 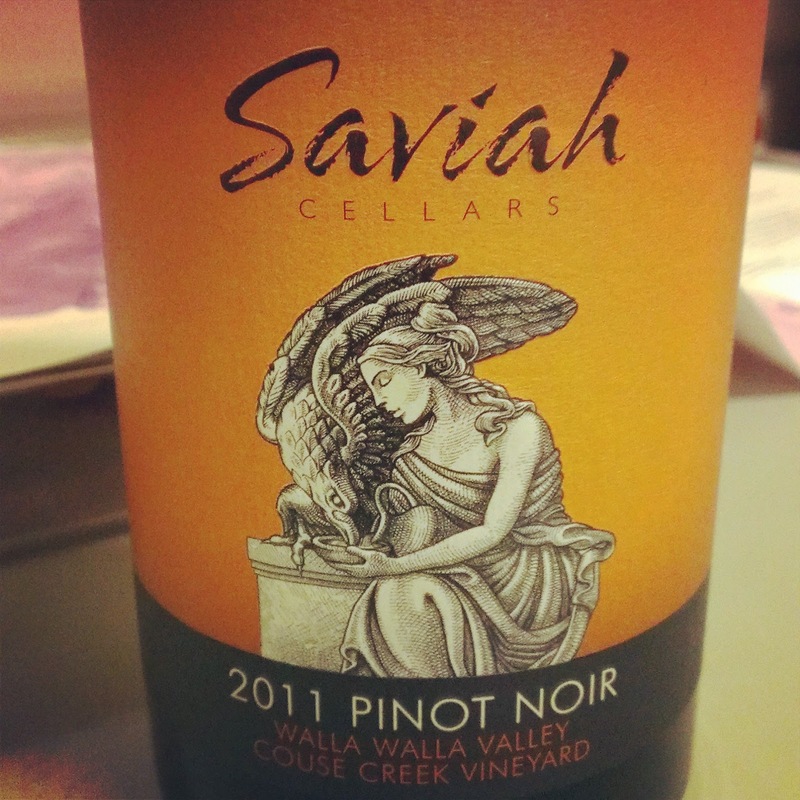 Rich embraces the ripe style of Pinot that the vineyard is producing, and the Saviah Couse Creek Vineyard even in the cool vintage of 2011 is certainly that. There's plenty of new oak influence on the wines aromatics, it's smoky, with aromatics of black plums and barrel spice. The wine is fuller bodied, with dark ripe fruit and spice, it tails off at the finish and doesn't carry the acidity that's commonly associated with cooler site Oregon Pinot Noir.